I think we all remember the heartbreak that everyone felt when Konami had a collective aneurysm and canceled Silent Hills. Since then, there has been a severe lack of crackling radios, fog-ridden towns, and supernatural mysteries. Thankfully, Welcome to Hanwell is here to fill that gap. Now, the only reason I mentioned Silent Hill was to make a comparison. Welcome to Hanwell is very much its own game with a very different setting. That being said, is this a town horror fans should visit for an extended stay? Read on to find out! Welcome to Hanwell throws you into the action pretty quickly. The initial setting in mysterious underground tunnels quickly gives way to the massive open world of the town. The story in the game comes in the form of documents, voicemails, and recordings. These are spread throughout the open world like breadcrumbs, only offering small glimpses into the grand mystery. In Hanwell, monsters are a part of daily life. Known in the game as anomalies, these creatures come in various shapes and sizes, from recognizable threats like spiders to grotesque and twisted monstrosities that hunt you relentlessly. Thankfully, the Hanwell Council of Public Protection has measures in place to warn people when anomalies are approaching. Loud sirens will blare to give you a heads up, and your trusty radio will crackle with static when enemies are nearby, a nice homage to Silent Hill’s similar mechanic. Once you’ve emerged from underground, the game offers some quick tips and guidance. You’ll quickly find a weapon and head out towards your first main objective. The controls are simple and the combat is easy to grasp. The first thing you’ll probably notice about Welcome to Hanwell is the atmosphere. It’s thick, almost tangible, from the moment you start playing. That sense of dread also follows you into the interior areas, where plenty of gory details and chaotic scenes set the tone nicely. The urge to know more about the town of Hanwell and the fate of its inhabitants is extremely strong from the moment you start playing. It feels like a place that was lived in and suddenly abandoned. 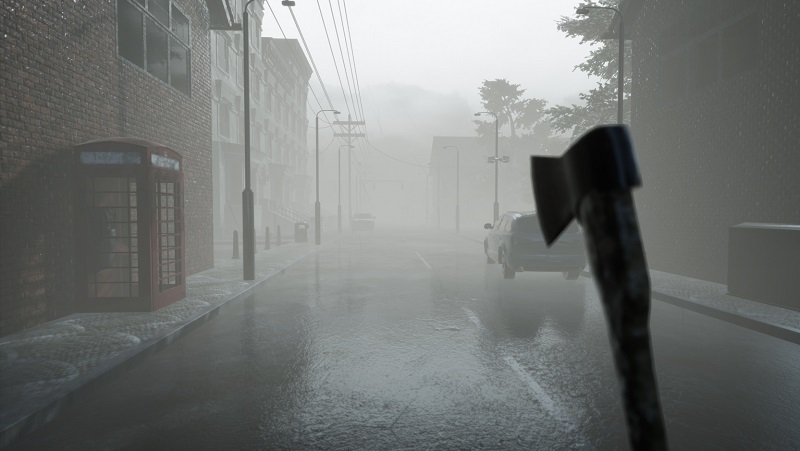 Cars are left in the streets, various weapons like hammers, baseball bats, and axes are strewn across the ground as you explore, and the ever-present fog casts everything in an eerie light, even during the daytime. The mystery behind everything is a slow burn, especially if you aren’t running directly to each of the main locations to progress the story. This is fine, but I really would have liked more consistent and engaging details about the story and the world. With a very minimalistic pause menu and inventory, I could help but feel like there were opportunities here to flesh out the game’s lore with item descriptions or at least the ability to read documents you’ve found or listen to recordings again. The world of Hanwell is incredibly interesting, but it offers more questions than answers, which becomes frustrating when you want to know more but can’t seem to find it. At a certain point, about halfway through the game, I started to feel fatigued as I searched for answers. There’s no shortage of collectibles to be found, but the game’s primary objectives are only shown to you once at the beginning. After this, the map becomes threadbare and only shows the locations you’ve discovered. Since I refused to look at a walkthrough, this led to me mindlessly wandering the town searching for the next step forward. The main goal of the game is to collect the piece of a citizenship ID card for reasons that I won’t spoil here. Everything else is just exploration and seeking out collectibles. Since the game’s enemies and weapons are randomized, you’ll find locales where weapons are plentiful and enemies as well. One particular type, a black smoke that blinds you, seemed to have a personal vendetta against me for a good twenty minutes as I tried to put distance between myself and it. Other times, I would find myself attacked with no way of defending myself. In the case of a particular teleporting enemy type, this was essentially a death sentence as no amount of sprinting could save me from her range of attack. That being said, the combat does work well. Attacks have a good amount of weight, and the finishing blow is always shown in brutal slow motion. Thanks to unlimited sprinting, it’s also pretty easy to get around. ATM machines represent places to get a quick save in while you’re exploring as well. Many of the buildings are closed off to you, but you will find a good variety of places where you can step inside to explore. Some of these will offer some additional story or the next piece of the card, but many will just have collectibles. The map is absolutely massive, which is a double-edged sword. Since you can only zoom out so much, it takes a while just to scroll through all of it. Buildings, where you can enter, are marked, and you can see some collectibles from the bird’s eye view, but otherwise, the map does little else than show you where you are. I like the freedom that Welcome to Hanwell offers, but I would have liked more detail for those of us who want to pursue the story. That being said, if you relish in the tension and terror of wandering through foggy streets and exploring abandoned buildings, there’s plenty to be found here. If there’s one thing that game never loses, it’s that sense of atmosphere. The constant threat of enemies that could be looming around the next corner always had me on my toes. Interior sections were especially terrifying. One of the story objectives takes place in a prison, for example, and this scripted scene built the tension to a fever pitch. In the climax of that scene, I screamed out loud, paused the game, and threw my controller. I can count on one hand the number of times that has happened in my gaming career, so my hat’s off to this title for truly scaring the sense out of me at that moment. In keeping with Welcome to Hanwell’s simple gameplay and menus, the presentation overall can be described in a similar fashion. While the streets of Hanwell may seem a little bland at times, the interiors all have their own unique style and character that really made them stand out for me, even if I wasn’t there for story purposes. Performance was also spot-on for me on PS4 Pro. The game had a consistently smooth frame rate with polished graphics across the board. I encountered little-to-no glitches at all during my time in Hanwell. The music also appropriately terrifying when the action ramps up, but there were times that it would play combat music while I was exploring an abandoned house or business with no enemies in sight. It had me on edge for no reason, but other than those moments, the music was spot on for me. There’s no denying the similarities between Welcome to Hanwell and horror classics, but don’t let this game’s cover fool you, this is very much its own beast with plenty of skeletons in the closet. For those itching to uncover a town’s dark secrets while contending with its demons, Welcome to Hanwell is ready to fill that Silent Hill-sized hole in your heart.